Days into his new avatar as Chief Minister of Haryana, Manohar Lal, prefers to carry on his simplicity demeanors, even in the corridors of power. At a lunch hosted at the chief minister’s residence on the day he stepped into his new house after the ceremonious Hawan and puja, everyone was left amazed as Khattar stood up to join the queue with a plate and cutlery in his hand. He waited patiently for his turn to grab a bite along with other party workers and leaders even as his colleagues and senior staffers continued unsuccessfully impress upon him to let the butlers serve him food on the table. Khattar moved around like a commoner interacting with his staff and party men over lunch. In a state that has long witnessed an overdose of VVIP culture and outrageous paraphernalia for those in power, Khattar preferred to rationalize all of this soon after taking over charge of his office. Sources said, the chief minister has ordered to prune his security and cavalcade to the bare necessity with a hope that others in the cabinet and officialdom follow suit. The idea, said sources, is also to mellow down the unfriendly disposition that invariably creeps in with the stature of a chief minister.Khattar has a lot of ‘firsts to his credit’ and advantage. As first time MLA and CM, it was for the first time in his life that Khattar entered the Haryana civil secretariat as well as the Chief Ministers Office on Sunday. It was also the first time that he entered the CM’s residence. It is for the first time that a CM officially observed Mangal Sain Jayanti in the state. 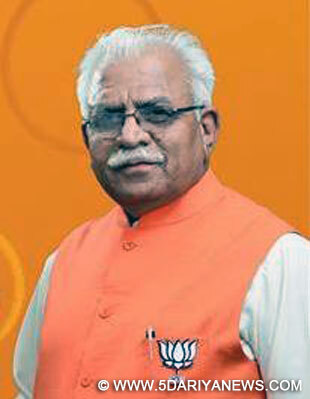 The first time Chief Minister who won his debut election with a huge margin from Karnal is also the first CM to stay at the CM’s residence without his family of brothers, sisters and other relatives.Having spent a lifetime grounded working at the grass root level, Khattar has sent the message loud and clear. During his impressive swearing in ceremony attended by Prime Minister Modi at Panchkula on Sunday, Khattar’s brothers and other relatives sat like the others in the public in the general gallery area, although they had a choice to suit in the VIP gallery. Manohar Lal has asked his relatives to meet him as Manohar Lal not as CM Haryana.